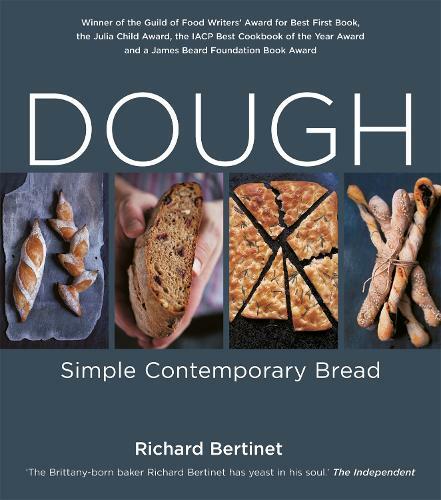 Richard Bertinet is renowned for his revolutionary and inspirational approach to breadmaking and his award-winning book Dough is an invaluable and beautiful guide to making simple, contemporary bread, with a 30-minute DVD giving additional guidance and step-by-step recipes. Richard brings fun to breadmaking and with his easy approach, you will never want to buy a supermarket loaf again. Each of the five chapters begins with a slightly different dough - White, Olive, Brown, Rye and Sweet - and from this 'parent' dough you can bake a vast variety of breads really easily. Try making Fougasse for lunch, bake a Ciabatta to impress, create Tomato, Garlic & Basil Bread for a delicious canape or show off with home-made Doughnuts - each recipe is a delight. Since it's publication in 2005, the book has been translated into 8 languages and sold over 100,000 copies. It won the Julia Child Award, the IACP Best Cookbook of the Year Award, a Guild of Food Writers' Award and a James Beard Foundation Award and was shortlisted for an Andre Simon Award and a Glenfiddich Food & Drink award. I bought this for a Christmas present , so I personally haven't made anything from it, but the recipient is absolutely delighted with it. He says it is easy to follow and the results are amazing.